Did you ever notice how many of your most beloved childhood foods taste better in your memory that in real life? It’s kind of sad and yet somehow fascinating; now that I eat mostly whole foods and try to steer clear of added artificial crap, those treats I adored as a child taste eerily fake and often leave a lingering plasticky taste in my mouth. Don’t get me wrong, I can get down on a bowl of Cinnamon Toast Crunch or an ice cream sandwich from time to time, but as a general rule the edible foodlike substances of my youth have lost their luster. 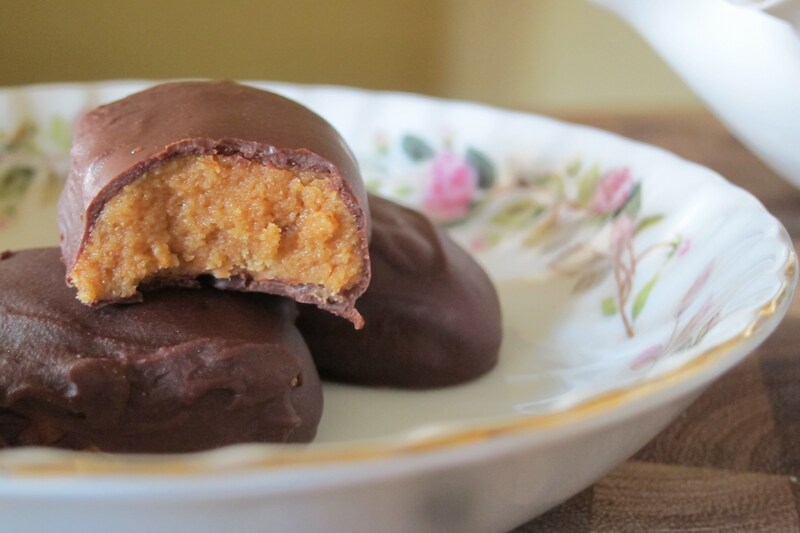 Reese’s peanut butter cups fall into this category. I remember those commercials that would feature all the different ways to go about eating your Reese’s. My favorite one was to poke a perfect hole in the middle, eat that first and then nibble away at the grooved, rigid outer ring. Now when I eat a Reese’s, all I taste is a fistfight between salt and sugar with a hint of peanut butter flavor egging them on in the background (no pun intended). So when I saw a recipe for copycat Reese’s peanut butter eggs on Pinterest, I was all about making a revamped version of my old Easter basket fav. 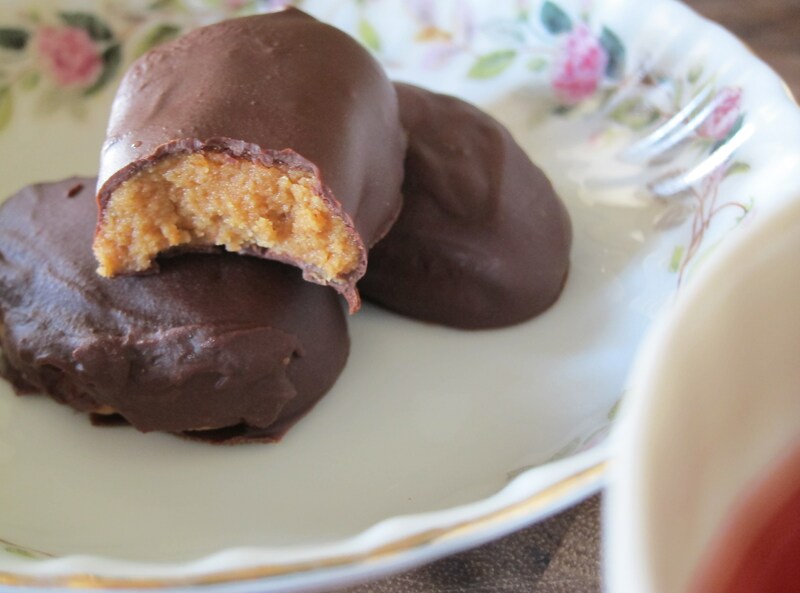 These tasty nuggets of joy are made from just seven wholesome ingredients. The texture is freakishly similar to the store bought ones, but the taste is supremely better. Coated in bittersweet chocolate and scented lightly with vanilla and cinnamon, these actually “taste of what they are” which is mostly straight-up peanut butter. Coconut flour is the binder and thickener for the filling, maple syrup sweetens the deal just a touch. As long as you can form a semi-reasonable egg shape and refrain from licking your fingers every five minutes while coating these, you should be just as successful in making them as I was. Happy Easter. Have a wonderful weekend of renewal, reunion, and refreshment. Ingredient note: Coconut flour is soft flour produced from dried coconut as a natural byproduct of coconut milk production. As my friend Elizabeth, who introduced me to this versatile, gluten-free flour, has pointed out, “it’s almost all fiber” and for this reason, it absorbs liquid like a sponge and cannot be substituted for AP flour in a 1:1 ratio. It’s best to use coconut flour in recipes that were created with this ingredient in mind, like this one or this one! Coconut flour is an exceptionally good source of the essential micronutrient manganese. Manganese helps our bodies optimally utilize choline and biotin (found in eggs), vitamin C and thiamin. Manganese also supports a healthy skeletal and nervous system and promotes thyroid health. Coconut flour can be found in most well-stocked grocery stores (Bob’s Red Mill has a version) as well as in the bulk section at many natural food stores (including the Milwaukee-area’s Outpost Natural Foods). Combine the peanut butter, coconut flour, maple syrup, vanilla and cinnamon in a medium bowl. 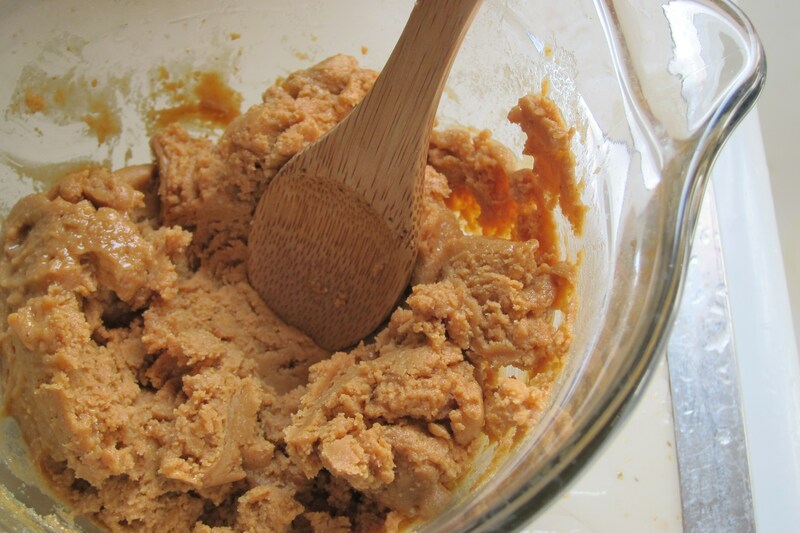 Mix well using an immersion blender, food processor, or a fork and a very strong arm. The filling should be similar to the texture of cookie dough. If it’s more runny than that, add a tiny bit more coconut flour. 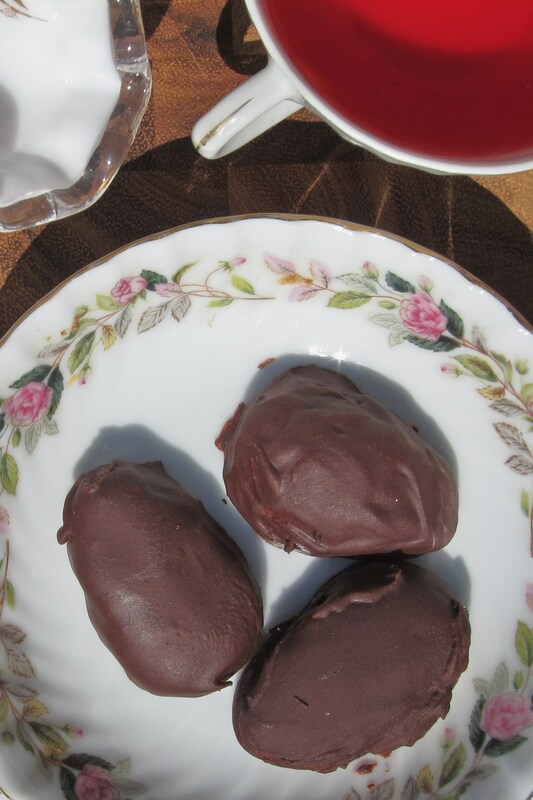 Place the “eggs” on a lined baking sheet and stick them in the freezer while you heat up the chocolate, at least 5 minutes. Using a double boiler over simmering water, melt the chocolate chips and milk together until smooth and creamy. 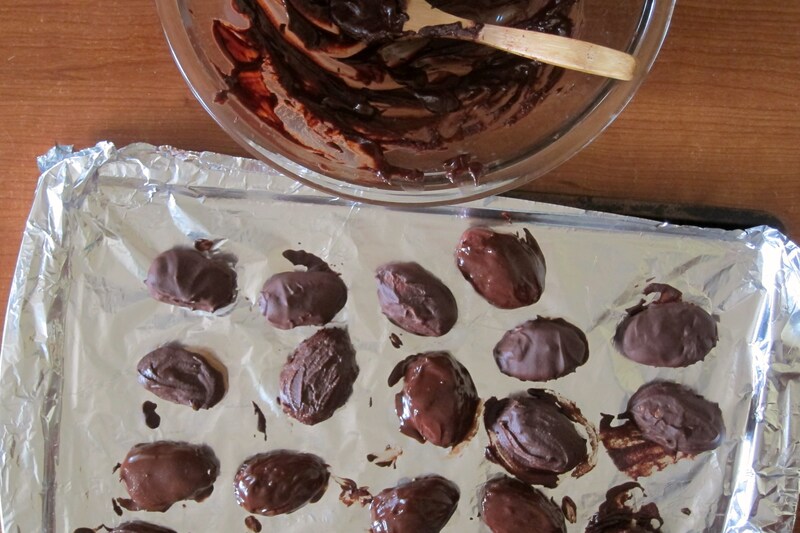 Remove chocolate from heat and retrieve the eggs from the freezer. Stick the eggs back in the freezer to let the chocolate set for an hour or two, storing them there until ready to share. Guaranteed to be a hit with bunnies, rabbits and even the occasional hare at your holiday gathering.